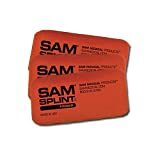 Buy new – Sam Medical Sam Splint Finger Splint, 3-Count (Pack of 3) | Medical Supplies and Equipment. I am trying this to keep my finger straight but it is not strong enough. Maybe it is for other purposes.